XPages CSJS timing issue – what is ‘this’ ? 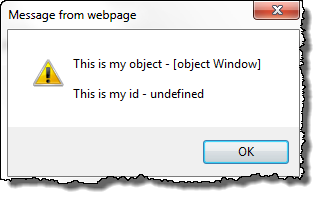 In this case I am passing the “this” object to the function. and then at the bottom of the web page source code we can see the assignment of the event after during the “addOnLoad” which means after the page has loaded. The XPage is adding the function “view__id1__id2__id37__id40_clientSide_onclick” to the “onclick” event of the “view:_id1:_id2:_id37:button1” DOM element (our button in this case). The nuances of this are subtle but important – the code is not adding “alert(whetever)” to the onclick event it is adding a function call to the onclick event. So. when the button is clicked the function view__id1__id2__id37__id40_clientSide_onclick executes it’s code and in that situation ‘this’ no longer refers to the button. “this” is never passed to the view__id1__id2__id37__id40_clientSide_onclick() function and therefore any reference to the button is lost. When the function executes – “this” refers to the function (which isn’t an object) and therefore we get the window (the webpage) as a failover. 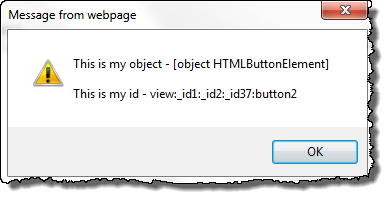 If you need to do something like this then add the onclick event to the source pane. <xp:button value="or Click this" id="button2"